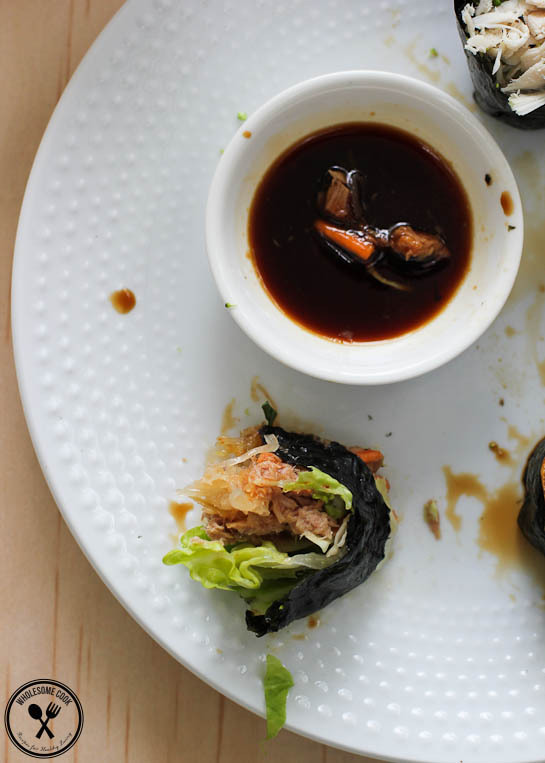 These clever Rice-free Nori Rolls are my new lunchtime staple. Made with a healthy helping of greens they are grain-free, nut-free and gluten-free too. As for the filling ideas, here are three of my favourite suggestions below. It’s such a cliché to act all surprised at the end of November that the year is almost gone, but 2013 has been swift, even the kids think so and that says a lot! We’ve sure had a busy one with this exciting event, buying a house and various work projects we both had been involved in. Now, exactly a month from today we will be watching the cricket , eating leftovers and reminiscing with family and friends about the year just gone by. And just as eagerly we’ll all be dreaming up plans for the new year ahead. But before that time is upon us, I thought I’d share this quick recipe that’s great for getting a nutritious feed during the busiest 30 days of the year. And, it’s actually quite easy to do. 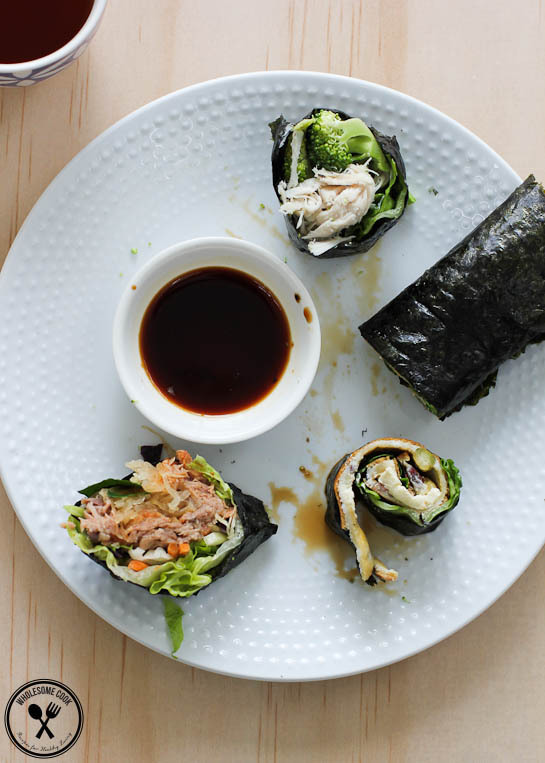 So, how does this Rice-free (Paleo and grain-free) Nori Roll work? Almost exactly a year ago, I posted this ever so-obvious-yet-clever Quinoa Sushi Roll recipe, because I have never been a big fan of rice. The recipe is great if you have some spare cooked quinoa lying around in your fridge, which in itself is not that bad of an idea, or if you have time to cook it. But being a busy homemaker, home-front construction project manager, blogger, writer, photographer, school-picker-upper and so forth, I don’t always have a spare half an hour to follow this step. Instead, I layer my nori sheet with one or two lettuce leaves. They can hold the fillings in well in case the nori sheet breaks. 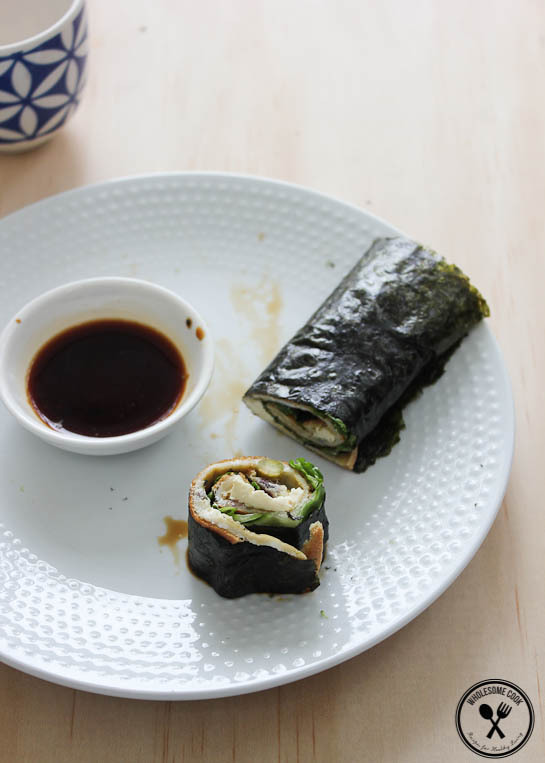 Then simply dot with the toppings, wrap, roll up and enjoy while the seaweed is still crunchy! What’s not to love? I let my sushi filling imagination run wild but do include loads of greens for maximum health benefit. Exact ingredients and measurements can be found in the recipe card below, but here is what I’m liking at the moment. Sauerkraut is one of my current favourite toppings because it’s great for good gut health – it is the perfect probiotic source for vegans and those allergic to dairy. Egg omellette is a classic protein-rich and obvious choice, but when cooked with a handful of sprouts mixed in, it can not only prevent them from falling out of the roll but also delivers some great health benefits from them. I also like the idea of a quick barbecue chicken roll with a salad of avocado and raw sliced broccoli – again, with the focus on greens. Or even leftover cooked fish or mince – something like Chilli Con Carne, would also be fab! What do you think? 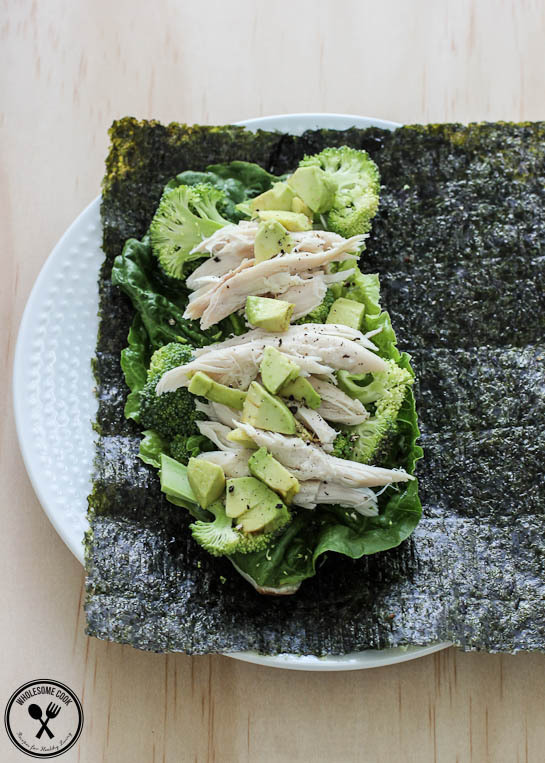 What would make a good and quick Rice-free Paleo Nori Roll filling? Feel free to share your ideas. I just wanted to say welcome to all of the new subscribers – thanks for choosing to stick around. Please feel free to make Wholesome Cook your home of culinary inspiration. And do share your thoughts, tell us all what you are cooking, share photos of Facebook or Instagram of the blog dishes you’ve made. Or tell us how you would put your own little twist on some of the recipes. Let’s give this space a community feel. Now and in 2014. Below you will find three Rice-free Nori filling suggestions, but you can make them your own quite easily - just let your sushi filling imagination run wild. Fill with traditional fillings of smoked salmon and avocado, vegetables, teriyaki beef or tuna, or use up leftover grilled fish, meats or even dishes like chilli con carne! I recommend 2-3 nori sheets per serve as you won't be filling up on rice. You could use smoked salmon in the Omelette version instead of tuna as well. Add nuts and seeds if you can eat them for an extra nutrition boost. Repeat with any additional rolls. 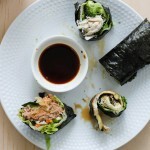 Cut rolls in half or eat whole, serve with soy sauce or tamari. Whisk together the egg, sprouts and feta (or fish). Cook in a small frypan set over medium high heat, greased if required, for 4-5 minutes. Really wonderful recipe Martyna! I love that it is grain free. It’s realy hard not to get bored with salad lunches and I definitely feel I could make this to keep life a little more interesting while still being healthy! Thank you Amanda. That’s the thing… I love my tuna salad, but eating it this way makes it a tad more interesting and the toasted flavour in the nori (and crunch!) really come through. Love the photos – they are so simple but look tasty! Thanks for the heads up too on no rice. I would try a grilled vegetable salad with feta as fillling. YUM! Oh that sounds delicious too – you know, I used to get a grilled vegetable and feta salad when I used to work in the city. It would work really well here indeed. These are our dinner about 3x week. 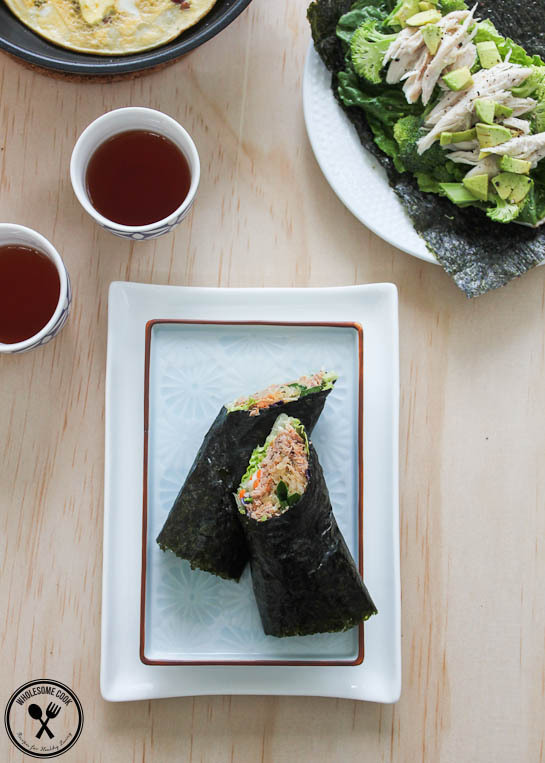 We usually do just canned wild salmon, tuna or sardines mixed with avocado and wrapped in nori. Sometimes we add kimchi. Sometimes we use lettuce leaves or a plain omelette like you. Great stuff. Oh! Kimchi… that sounds great too instead of sauerkraut. I’ve never made these for dinner but I’m going to change my ways! They are a great option on a hot night when you just couldn’t be bothered cooking (I’m sure it happens to all of us sometimes?). Oh this sounds so nice! I can think of enjoying a salad Nicoise filling in this with tuna, olives, beans, tomatoes and a little egg. A good Ideas These clever Rice-free Sushi Rolls,, I would try a grilled vegetable salad with feta as filling.! It’s fantastic to see you getting involved with health and nutrition specific causes. Cutting out sugar, making sustainable choices around meat and farming in general. Keep up the good work Martyna! I hope one day you will be able to gather all your wisdom and share it with us in a book. I’d totally buy one and share copies with my family too! Hey Marthyna! Another great recipe! I tried this last weekend and my entire family liked it. I’ll definitely try this out again soon! BTW, the three healthy filling ideas are great as well. Thanks for the inspirations. I really enjoyed this post. I love sushi, since it’s pretty easy to cater to dietary needs. I hadn’t ever considered a sushi improvisation for those on a paleo diet! The recipe and filling ideas are great and I’ll certainly be trying them soon. Thanks for the post! I HAVE CELIACS AND LOVE SUSHI ROLLS AND HATE THE GLUTEN-FREE JUNK FOOD BECAUSE IT IS WAY TOO STARCH & I GAINED WEIGHT.